(Tuesday, December 8, 2009, Toronto - The Ontario government's plan to reduce greenhouse gas (GHG) emissions does not have the tools necessary to meet its GHG emission targets. The government is projecting that it will fall short of its goals, even though the future reductions projected by the government are based on an assumption that all initiatives will be implemented 100 per cent successfully. 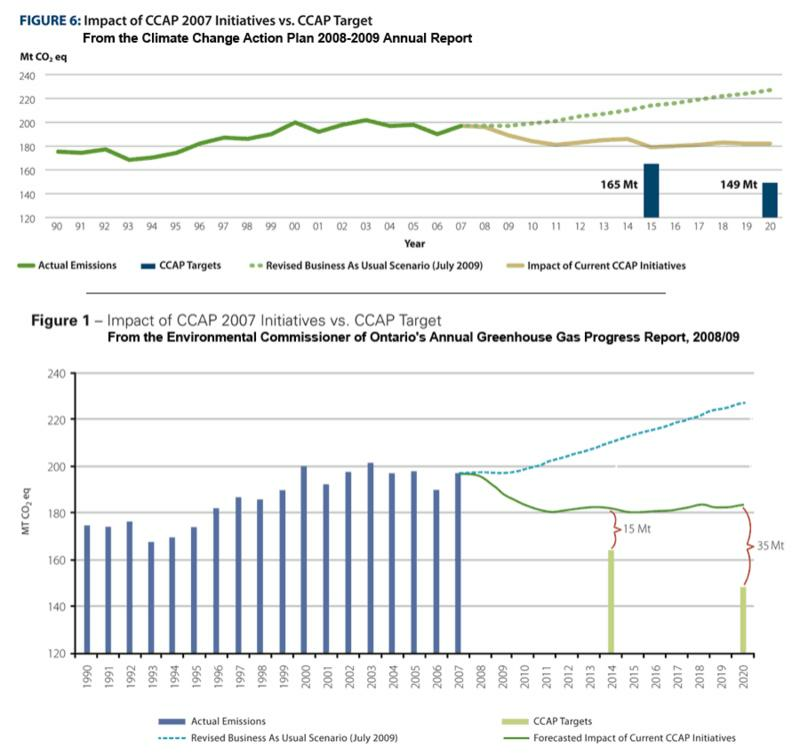 "Having targets is important, but having the tools and techniques to meet those targets is critical," said Gord Miller, the Environmental Commissioner of Ontario, in his report, released today, entitled Finding a Vision for Change: Annual Greenhouse Gas Progress Report 2008/2009. "If I were to give the government of Ontario a grade on this report," Miller added, "it would be an 'incomplete'." Climate change due to human emissions of GHGs is a recognized global crisis. World leaders are currently gathered in Copenhagen to hammer out an international agreement on reducing GHG emissions. Ontario has set targets and clearly is making some progress. However, there is more work to be done and, without a clear vision for change, Ontario will fail to live up to international expectations. The only opportunity to eliminate the shortfall in meeting the target set for 2020 requires placing considerable faith in the successful and timely implementation of a cap-and-trade system. As well, most of the projected reductions in the short term are expected to come from a single initiative - the phase-out of coal from Ontario's power supply. While this will result in substantial reductions in the electricity sector, the government's plan, at present, does not project significant reductions in other sectors such as industry and transportation, nor other fuels such as natural gas. "The government's focus on electricity conservation displays an apparent blind spot for conserving natural gas, the next fossil fuel to focus on once coal is eliminated," stated Miller. 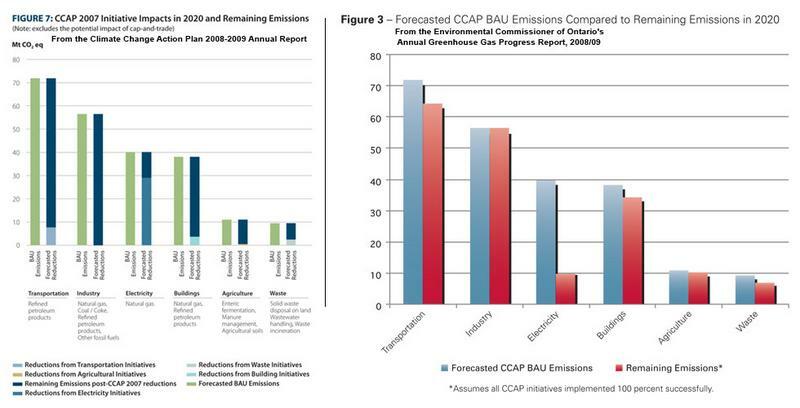 In 2007, the Ontario government established targets to reduce GHG emissions. On December 2, 2009, the government reported on steps it has taken to achieve these targets, outlining a range of measures it is taking to reduce GHG emissions, including 14 key initiatives. Gord Miller, the Environmental Commissioner of Ontario (ECO), is an independent officer of the Legislative Assembly of Ontario. Pursuant to recent changes made to the Environmental Bill of Rights, 1993, the ECO is responsible for reviewing the progress of activities in Ontario to reduce emissions of greenhouse gases and independently reporting its findings to the legislature. On December 8, 2009, the ECO released its report entitled Finding a Vision for Change: Annual Greenhouse Gas Progress Report 2008/2009. Watch videos below for the remarks from Environmental Commissioner about the Ontario government's GHG emission targets. Government and ECO Figures showing projections of GHG emissions in 2014, 2020 and 2050.